For other uses, see Gingerbread (disambiguation). Originally, the term gingerbread (from Latin zingiber via Old French gingebras) referred to preserved ginger. It then referred to a confection made with honey and spices. Gingerbread is often used to translate the French term pain d'épices (literally "spice bread") or the German term Lebkuchen (Leb is unspecified in the German language. It can mean Leben (life) or Laib (loaf), kuchen = cake) or Pfefferkuchen (pepperbread, literally: pepper cake). During the 13th century, gingerbread was brought to Sweden by German immigrants. In 15th-century Germany, a gingerbread guild controlled production. Early references from the Vadstena Abbey show how the Swedish nuns were baking gingerbread to ease indigestion in 1444. It was the custom to bake white biscuits and paint them as window decorations. The first documented trade of gingerbread biscuits dates to the 17th century, where they were sold in monasteries, pharmacies, and town square farmers' markets. In Medieval England gingerbread was thought to have medicinal properties. One hundred years later, the town of Market Drayton in Shropshire, UK became known for its gingerbread, as is proudly displayed on their town's welcome sign. The first recorded mention of gingerbread being baked in the town dates to 1793, although it was probably made earlier, as ginger had been stocked in high street businesses since the 1640s. Gingerbread became widely available in the 18th century. In England, gingerbread may refer to a cake, or a type of cookie / biscuit made with ginger. In the biscuit form, it commonly takes the form of a gingerbread man. Gingerbread men were first attributed to the court of Queen Elizabeth I, who served the figurines to foreign dignitaries. Today, however, they are generally served around Christmas. 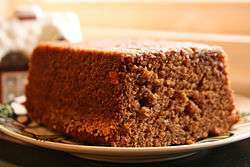 Parkin is a form of soft gingerbread cake made with oatmeal and treacle which is popular in northern England. 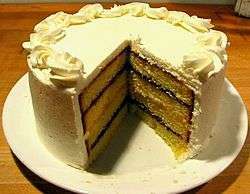 In the United States, this form of gingerbread is sometimes called "gingerbread cake" or "ginger cake" to distinguish it from the harder forms. French pain d'épices is somewhat similar, though generally slightly drier, and involves honey rather than treacle. Originally French pain d'épices did not contain ginger. In the Netherlands and Belgium, a soft and crumbly gingerbread called Peperkoek, Kruidkoek or Ontbijtkoek is popularly served at breakfast time or during the day, thickly sliced and often topped with butter. In Ashkenazi Jewish cuisine, the honey cake eaten at Rosh Hashanah (New Year) closely resembles the Dutch peperkoek or the German Lebkuchen, though it has wide regional variations. In the Nordic countries, the most popular form of ginger confection is the pepperkaker (Norwegian), pepparkakor (Swedish), brunkager (Danish), piparkökur (Icelandic), piparkakut (Finnish) and in the Baltic countries piparkūkas (Latvian) or piparkoogid (Estonian). They are thin, brittle cookies / biscuits that are particularly associated with the extended Christmas period. In Norway and Sweden, pepperkaker/pepparkakor are also used as window decorations, the pepperkaker/pepparkakor are then a little thicker than usual and decorated with glaze and candy. Many families bake pepperkaker/pepparkakor/brunkager as a tradition. In Switzerland, a gingerbread confection known as "biber" is typically a two-centimeter thick rectangular gingerbread cake with a marzipan filling. Biber are famously from the cantons of Appenzell or St. Gallen and respective biber are artfully adorned with images of the Appenzell bear or the St. Gallen cathedral by engraving or icing. In Russia, a gingerbread maker was first mentioned in Kazan cadastres in 1568. Gingerbread confections are called pryaniki (sg. pryanik), derived from the old Russian word for 'pepper'. 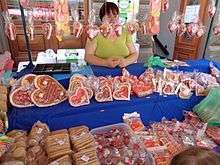 Historically three main centers of gingerbread production have developed in the cities of Vyazma, Gorodets, and Tula. Gingerbreads from Tver, Saint Petersburg and Moscow were also well known in the Russian Empire. A classic Russian gingerbread is made with rye flour, honey, sugar, butter, eggs and various spices; it has an embossed ornament and/or text on the front side with royal icing. A Russian gingerbread can also be shaped in various forms and stuffed with varenje and other sweet fillings. In Poland, gingerbreads are known as pierniki (singular, piernik). The most famous are called Toruń gingerbread (piernik toruński), a traditional Polish gingerbread that has been produced since the Middle Ages in the city of Toruń. It was a favorite delicacy of Chopin when he visited his godfather, Fryderyk Florian Skarbek, in Toruń during a school vacation. In Romania, gingerbread is called turtă dulce and usually has sugar glazing. A variety of gingerbread in Bulgaria is known as меденка ("made of honey"). Traditionally the cookie is as big as the palm of the hand, round and flat, with a thin layer of chocolate. Other common ingredients include honey, cinnamon, ginger and dried clove. Gingerbread is popular in England, and is available in supermarkets. As in other countries, Gingerbread biscuits are often decorated with Royal icing. In Panama, a confection named yiyinbre is a gingerbread cake made with ginger and molasses; it is typical of the region of Chiriqui. Another popular confection is quequi or queque, a chewy biscuit made with ginger, molasses and coconut. ↑ The Oxford Companion to Sugar and Sweets. Oxford University Press. 1 April 2015. ISBN 978-0-19-931362-4. ↑ Anderson, L.V. "Why Do We Shape Gingerbread Cookies Like People?". Slate Magazine. The Slate Group. Retrieved 24 December 2013. ↑ "What is the history of gingerbread?". eNotes. ↑ Slovar' russkogo jazyka XI-XVII vv. 21. Moscow: Nauka. 1995. p. 31. ↑ "Chef doma: Pryaniki i sbiten' Maksima Syrnikova". The Village. 14 December 2012. Retrieved 11 December 2015. Wikimedia Commons has media related to Gingerbread. Look up gingerbread in Wiktionary, the free dictionary.